All three species of cassowary are found in Papua New Guinea and the state of West Papua, Indonesia. In Australia, only the Southern Cassowary is present, and occurs only in North Queensland. There are three main populations. the Southern Cassowary occurs between Cooktown and the Paluma Range, near Townsville. 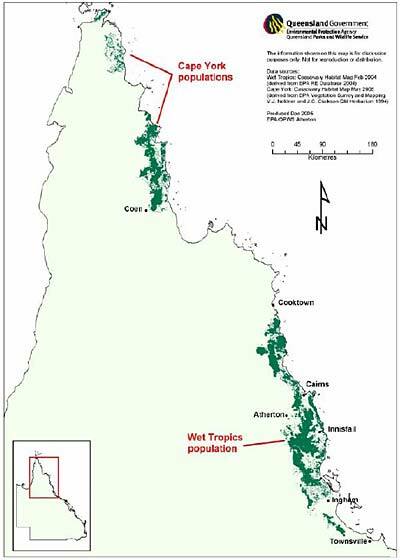 Although widely distributed in this area, it occurs patchily at both the local and regional scale due to extensive land clearing for farming and urban development in the coastal lowlands and Atherton Tablelands. northern Cape York Peninsula, centred on Shelburne Bay. eastern Cape York Peninusula, in the Iron Range/McIlwraith Range area from about Temple Bay in the north as far south as the Massey River and possibly into Princess Charlotte Bay. The distribution of the species is constrained by the availability of habitat which can provide a year-round supply of fleshy fruits and access to permanent freshwater for daily drinking and bathing (Buosi & Burnett 2006). Cassowaries are most often found in rainforest, but also use woodlands, melaleuca swamps, mangroves and even beaches, both as food sources and as connecting habitat. Cassowaries in coastal areas, such as around Mission Beach, seem to prefer a mix of these environments. They will move across open country to access food sources and are capable swimmers, though generally only do this in order to escape harassment by dogs or other cassowaries (Burnett n.d., cited in Buosi & Burnett 2006).